Don�t wish to be too dramatic, folks, but Wednesday�s Champions League showdown with Juventus is up there with the most important matches in the 70+ years I have been following the fortunes of Tottenham Hotspur. I know victory does not take Spurs into a final, but it will be a measure of the progress the team has made this season if they can clamber over mighty Juve into the last eight. That would cement Tottenham�s growing reputation as a very special side, playing football that is easy on the eye � compared to the dross served up yesterday by Chelsea and the melt-down occurring down the road at the Emirates. If you saw the Chelsea attempt to steal a point from Manchester City, you will get some idea of the tactics we can expect from Juventus in the second leg tie at Wembley. Antonio Conte, Chelsea�s so-cautious manager, was reared in an era when catenaccio � �door-bolt -� was the foundation of Italian football. It is a defensive system that makes the bus-parking by recent Tottenham opponents seem almost positive. You can bet your boots Juventus will come looking for a quick strike on Wednesday before barricading their goal behind a human wall. Those of us with Tottenham in our soul are going to need to be patient to new limits. Juventus are certain to have plans to suffocate Our Harry Kane and the mercurial Dele Alli, so there will be a lot of pressure on Son Heung-Min to continue his recent stunning form. His blistering acceleration and eye for goal could be what turns the game Tottenham�s way. 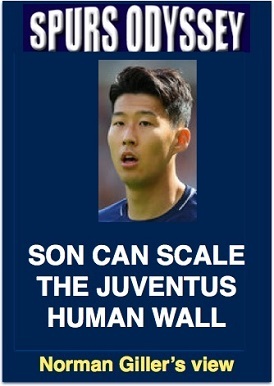 As our Spurs Odyssey guru Paul H. Smith describes HERE, Son is touching new peaks of perfection. But humbling Huddersfield is not quite in the same league as taking on the defensive might of Juventus. Take a deep breath. Wednesday is going to be a long night. The jury is still out on VAR. I am sure those of you who watched the farcical events in the FA Cup replay against Rochdale will agree that the system is nowhere near ready for duty in the World Cup finals this summer. I have been a strong advocate for the introduction of VAR, but now I�ve seen it in practice I am not so sure. Unlike rugby � accustomed to a stop-start rhythm � football needs motion and emotion, both of which were stifled by the eternity with which decisions were made at Wembley last week. Can you imagine when � just for instance � Ricky Villa�s �goal of the century� in the 1981 FA Cup final replay against Manchester City had been turned down after all the celebrations because the VAR judges spotted he had trodden on a City player�s foot during his dribbling run? I think it is going to cause more disputes than it settles unless they can find a way to make quick decisions that are RIGHT. To have the system and then get the call wrong reduces football to the sort of farce we experienced against Rochdale. Get it right, or drop it. WEEK 29 of the Sports Odyssey Quiz League 2017-18. The rules are simple: I ask one Tottenham-related question for which a right answer earns you two points, and then a related teaser that can bring you an extra point. Who has scored 21 goals in 75 appearances for his country, and joined Spurs from Ajax? What number Tottenham shirt does he wear? Please email your answers by Friday�s midnight deadline to: soql29@normangillerbooks.com. Question 28 was: Which Spurs right-back played 32 matches for England, captained them three times and won a League championship medal? From which club did he join Tottenham? Far too easy for Spurs supporters of a certain age: of course, Sir Alf Ramsey, who joined Spurs from Southampton in time to help the Push and Run team capture the League championship in 1950-51 Alf remains the best defender that I�ve seen wearing the No 2 Spurs shirt. First name drawn from the correct answers: Jim Logan who lives in Sanderstead and has followed Spurs since 1961. I will send Jim a screen version of my Spurs �67 book (I have now sold all copies, and the book raised �4,000 for the Tottenham Tribute Trust to help our old heroes Thank you all those Spurs Odyssey followers who gave their support).